← Has Elon Musk just engineered the short burn of the century? Electric hypercars aside (Pininfarina Battista anyone? ), one could be forgiven for looking at German automakers in search for the best pick. It must be said that some of their electric display was rather convincing. The VW group – striving as ever to leave the dieselgate scandal behind – especially impressed the public, with Audi leading the charge with not one but four fully electric cars, from the production e-tron Quattro and its lightly disguised upcoming sibling, the e-tron Sportback, to the e-tron GT and the Q4 e-tron, the important mid-size SUV concept at its world debut, based on VW’s new MEB platform. Audi’s beautiful EV lineup – fully slated for production – certainly offered concrete evidence of the brand’s effort to lead legacy automakers into electric mobility. But in what looks like a serious, direct challenge to Tesla, it’s perhaps difficult to find a novel approach to the EV dilemma: conquering the lower mass-market segments. With luxury and performance in mind, it’s not Audi’s priority to cater for the low end of the spectrum. Other interesting EV premieres from premium brands made it to the show: the Mercedes EQV, the first electric van to boast an impressive 100 kWh battery pack and 400 km (250 miles) range, or the Polestar 2 – Volvo’s answer to Tesla’s Model 3 with matching specs – to name a couple. These new entrants and other luxury EV concepts boosted Geneva’s electric display, as more and more upmarket electric models make their debut in 2019. But it’s definitely the more compact, popular electric models that should capture everyone’s attention, as they’ll be the ones tasked to push the EV market globally into mainstream. And this year, compact EVs were also firmly under the spotlight. Perhaps unexpectedly, Seat took the lead on this for the VW Group, with its MEB based concept el-Born. A Spanish version of the upcoming VW I.D. model and slated for production in 2020, it will boast long range (420 km under WLTP cycle from its 62 kWh battery) and 100 kW charging, very likely positioning itself on the affordable end of the compact EV segment, in direct competition with established models such as the new Nissan Leaf e+, the Hyundai Kona Electric or the Kia Niro EV. If the production version will be released – as it seems – with a choice of battery packs to include shorter range versions like its sister VW I.D., Seat might soon offer a compelling EV for a base price well below €30,000 (including taxes), even undercutting a European best seller such as the Renault Zoe. But the cheap Zoe won’t be challenged by Seat alone, as Peugeot chose Geneva to debut its new e-208 and mark the official entrance of the French brand into the world of e-mobility. With 340 km range (WLTP) for a 50 kWh battery, it is likely the small hatchback will also be priced to compete in the €25-30k range. Finally, competition is on the horizon in a once uncrowded segment. So are any of the above a true inspiration for new EV-things to come? It certainly looks like the EV market is rapidly growing in 2019 to include more and more mid-range models at affordable price points. Sub €30k electric cars will entice a much broader customer base into the world of electric mobility. But what about real entry-level EVs? This is the end game, as €20k electric cars would mark a truly seismic shift towards ordinary customers. Enter Fiat: the historically anti-EV Italian carmaker went to Geneva with… an electric surprise. Its Centoventi concept – a Panda-sized retro-inspired EV – is a fully electric car packed with clever ideas. 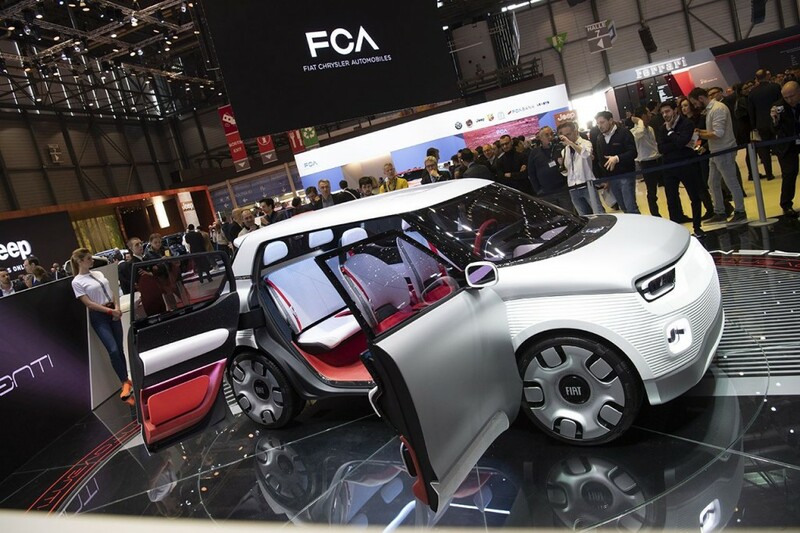 From 3D printable add-on gadgets to interchangeable seats to customisable body panels, this totally unexpected mini car (just 3.68m long) also boasts the most modular battery arrangement any carmaker ever thought of, which Fiat calls “Add-a-pack” battery system. From a single-pack, 100 km (62 miles) range base model, all the way to a five-pack 500 km (310 miles) top version, in 100 km increments. Up to four modules can be fitted at the bottom of the car, in typical EV fashion. Less typical, each could be purchased or rented as and when required, creating the option of a cheap city car that can turn into long range vehicle on occasion. For extra flexibility, the fifth battery would instead be fitted under the front seats and could be easily removed and used anywhere else, including stationary power supply. Simple ideas with a clever design, for a price that could start from as low as €15,000. What’s not to love? The Centoventi would be, as Fiat puts it, a “blank canvas ready to be outfitted”. And while gadgets and panels allow for endless customisation to attract different buyers and budgets, it is the ingenious battery system that, brought into a production car, could usher a new business model that finally delivers EVs to the masses. Fiat is late to the game but the company is adamant they are set on making the cheapest electric car on the market. 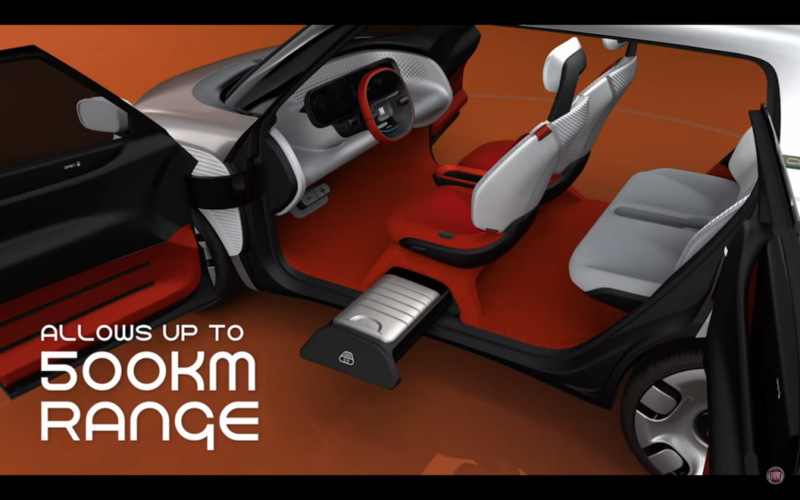 At Geneva they showed a blueprint for the next generation of electric mobility: modular, upgradeable, customisable. Most importantly, also feasible and cheap. 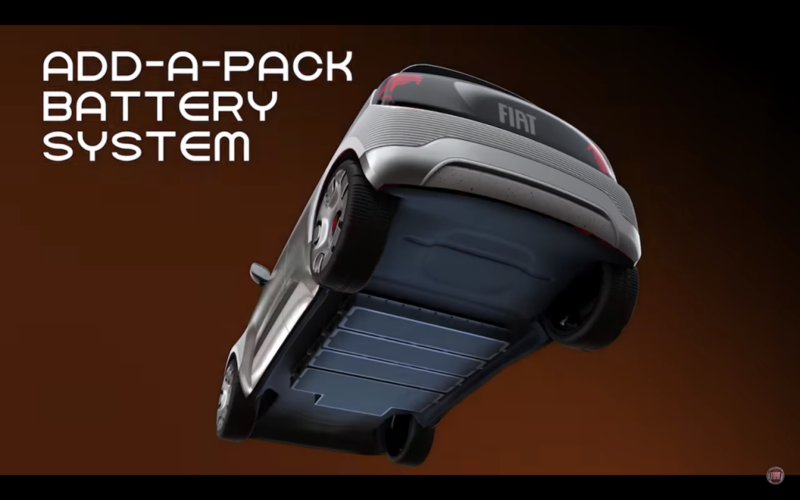 Unlikely as it may seem, this fresh, bottom-up approach to the electric car could not only mark Fiat’s successful entry into mass-market EV production, it could become the one for others to follow. This entry was posted in Green Cars. Bookmark the permalink. One Response to Was Fiat the surprise EV hero of Geneva’s Motor Show?